A lot of people wonder why I’m passionate about pizza. In a way, this video explains it. Happy Friday. This month, the Buffalo Spree is rolling out its Sweet Sixteen brackets of Buffalo Pizza. The winners will be revealed in the November issue, but you can read about some of the matchups now. Go there & comment on your favorites, and guess which pizza won. Those with the most correct answers will be entered in a drawing to win a basket of gear designed for making the perfect pizza at home. The waiter overheard us discussing another pizza joint we had tried a few weeks earlier. Specifically, he overheard us mention the fact that the owner was Turkish, and he offered flatbreads in addition to pizzas. The waiter had been somewhat short with us during our meal, but upon hearing “Turkish” and “wood-fired pizza” in the same sentence, he correctly identified the obscure hole-in-the-wall pizzeria clear on the other side of Toronto. Our waiter, Maurizio, then launched into a 10-minute monologue into why Dino’s pizza was just ok, but the restaurant where he worked – Queen Margherita Pizza – got it right. It had to do with the way in which the oven was designed. 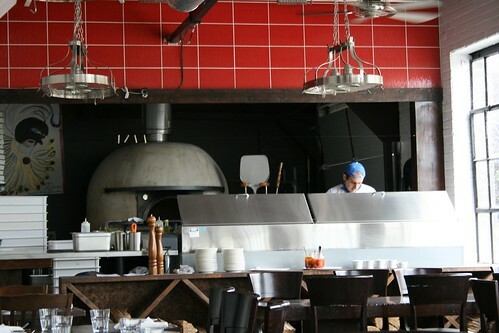 Dino’s oven was designed for flatbreads and has a higher ceiling – this requires more wood or time to get the heat right. Queen Margherita’s oven has a low ceiling, allowing for better circulation of heat. 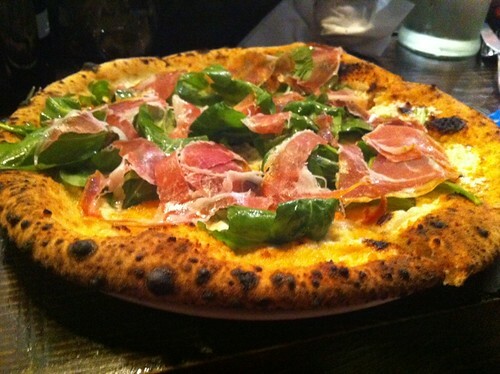 There are two places in Toronto that have earned and paid for the “Verace Pizza Napoletana” label. 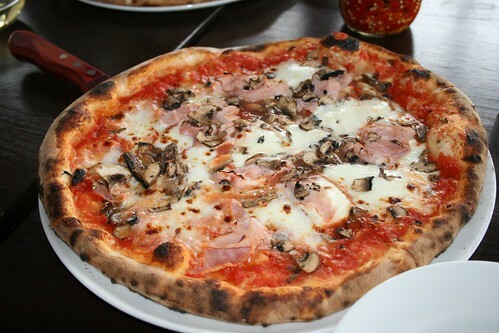 This organization requires the restaurant to use very specific, authentic ingredients – Tipo 00 flour, San Marzano tomatoes, and fresh mozzarella. Maurizio explained that the cheese was the hardest ingredient to get just right, but Queen Margherita uses fior di latte, which comes from cow milk, as opposed to Bufala Mozzarella. 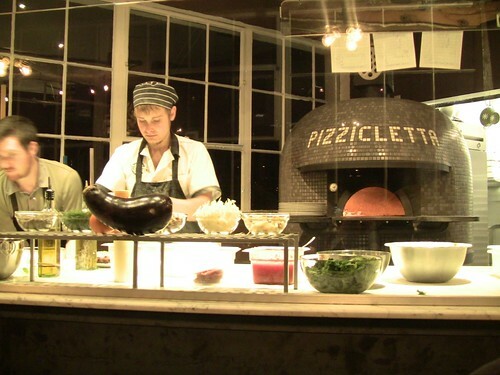 The two joints in Toronto that have the VPN certification are Queen Margherita on Queen East in Leslieville, and Pizzeria Libretto on Ossington near Dundas. The great thing about both restaurants is that it’s not an expensive night out. The pizzas are about 12″ across, so you can get a few for sharing, and they’re about $10 – 15 each. There is something so satisfying about a fresh pie right out of an 800-degree oven, especially when it uses top-quality, authentic ingredients. These pizzas aren’t drenched in grease, they deliver awesomeness on a chewy crust. I haven’t been to Libretto and Margherita in close enough succession to compare the two, but I’ll try to do so. The other thing I noticed is that poutine is so prevalent now throughout Toronto, even in gourmet form, but it’s completely absent in cold, hockey-crazy Buffalo. This ought be remedied. 1. If you rob a pizza deliveryman in Buffalo, you are hardly an enterprising criminal. Knock off a bank, maybe. But a pizza deliveryman? What are you going to make off with? A $20? Some pizza and wings? 2. If you rob a pizza deliveryman in Buffalo, are you really going to expose yourself to a gun-related felony? 3. Apparently, you will expose yourself to a gun-related felony – actually firing shots, no less – and you will make off with a large pie and 25 wings. That’s got to be the most pointless armed robbery in recent history. Zetti’s still makes an awesome pie at University Plaza on Main near UB South. Romeo & Juliet’s on Hertel, and their new location at Sheridan near Evans/Hopkins is awesome. Trattoria Aroma on Bryan (old Just Pasta location) and on Main Street in Williamsville is divine. A new entry – Molinaro’s, which is out of Lockport but opened a location in East Amherst in the former Teta’s – is very good indeed (get the traditional sauce – not the sweet or semi-sweet), complete with a sprinkling of oregano on the pie. But there’s always Gino & Joe’s two locations in the execrable Main Place Mall, which gets a special mention in today’s Buffalo News. It’s the closest thing to a regular Manhattan pizza joint you can get, as it’s right downtown and sees every type of person come through its doors on any given day. New York-style pizza, which dates back to 1905 in New York’s Little Italy, is identified by its wide, thick and foldable slices. It’s traditionally hand tossed. Ferro says the secret to his success are the ingredients he uses, and the preparation. “We’re one of the few people who still grind their own tomatoes. Nobody grinds their own tomatoes anymore. I get the whole tomato and juice from Italy,” he said, through a supplier in New Jersey. Wide, thin, foldable slices. Thin. Not thick. Sicilian is thick. That, and the main difference between proper, real New York pizza and Buffalo pizza is the fact that the cheese and sauce blend to become one on a New York pie. On most Buffalo pizzas, if you lift up the cheese, you get a big hunk of cheese, and the sauce is completely separated from it and remains on the usually sloppy, floppy, thick “crust”. And next time you go down to New York, make a pilgrimage to the original – Lombardi’s at 32 Spring Street.